Recently, I found myself puzzling over the social media post of a self-identified conservative. This individual questioned why so many people fear the political left these days given the rise of populism (which resulted in the election of Donald Trump to the presidency) and the fact that prominent operatives on the left are employing histrionics, slander and depraved rhetoric to a degree that—as this individual postulated—they can’t help but alienate an increasing number of Americans, thus decreasing their future chances at the ballot box. While I certainly appreciate the “glass half full” perspective of such a person, it is at times like this in which I wonder if I’m the one who perceives the dark designs of socialists in America and their single-minded determination for what they are. I for one will readily admit to being more fearful of socialist ascendency in this country right now than I was when Barack Obama was president—and I was pretty damned fearful then. Yes, it is true that Donald Trump was elected to the office of President because a preponderance of voters were disgusted with the political status quo and the lies of the parasites we’ve been sending to Washington for decades. I suspect that many of those who voted for Trump were also beginning to perceive that the two-party system has become a lie, that the Democrat Party has become overwhelmingly socialist in the operative sense, and that the Republican Party exists to provide little more than an impotent foil against them, misdirecting their base as socialists on the Democrat side gain more and more ground. Yet, inasmuch as an animal in the wild can become considerably more dangerous when it is cornered, I believe that the left has become similarly more dangerous because of the threat of President Trump and the populist leanings of the electorate. While radicals of many stripes were empowered by the solidarity they enjoyed with the White House when Obama was president, we have nevertheless seen a dramatic expansion of their efforts and an amplification of their rhetoric since Trump became president. The phenomenon of “democratic socialism” presently being marketed by the left like a “Tickle Me Elmo” doll or the newest X-Box certainly evidences this. Under Obama, they were comfortable and assured. Now, they’re desperate and terrified. Even more disturbing is how evident the insinuation of radicals at the highest levels of our government has become. While the moronic blathering of an aging actress that “Make America Great Again” ball caps are “the new KKK hood” and the pitiful contention on the part of Kamala Harris that an attack on a young black actor in Chicago was somehow Trump’s fault may be emblematic of the left’s penchant for hyperbole and deceit, they’re still just individuals voicing baseless charges. The degree to which the machinery of our government has become compromised however, should chill the reader to the bone. 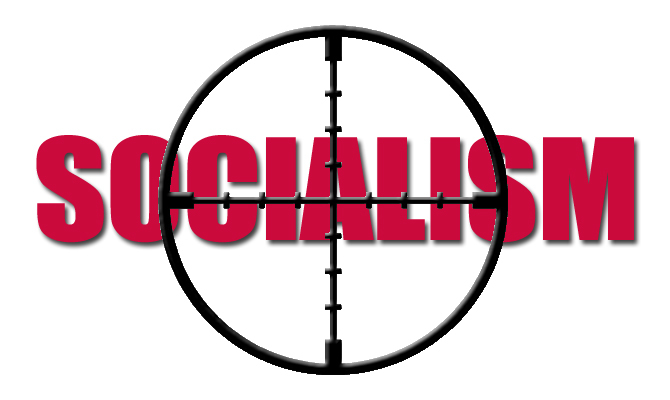 The bottom line is that we can acknowledge the scope of this threat and begin crushing socialists in America ruthlessly, or we can be ‘civilized’ and wait for them to finish coalescing their power and come for us.